One of the world’s finest camellia collections exists at Massee Lane Gardens. The home of the American Camellia Society since 1968, Massee Lane actually has several separate camellia gardens. The formal camellia gardens at Massee Lane began as the private garden of David C. Strother in the 1930s. As his love affair with camellias grew, Strother soon surrounded his farmhouse with camellias. He then began the gardens that are now Massee Lane. Year by year, he expanded the garden borders to accommodate the new camellias he wanted to grow. It is said that he never included a camellia he didn’t like, even if a friend had given it to him! The original brick walkways installed under Strother’s direction are still in place and allow for easy viewing of much of this area. In 1966 Mr. Strother donated these gardens and the rest of his 150-acre farm to the American Camellia Society to serve as its headquarters. Currently, over 1,000 varieties of camellias can be found in these gardens. While the largest number of cultivars is of Camellia japonica, Camellia sasanquas, Camellia hybrids and a number of Camellia species add variety to these plantings. Bloom starts in September and continues through the winter months into spring, with the display peaking in February and March. All throughout fall and winter, the fragrance of tea olive, Osmanthus fragrans, and that of winter daphne, Daphne odora, from January through March, add much delight to a visit to this part of Massee Lane. The floral display does not stop with the end of the camellia season, however. Camellias continue through March into April and, though their numbers are fewer than during their peak, the same gardens are graced with large plantings of a long succession of azaleas, both native and exotic species and hybrids. There are also Lady Banks roses at this time. Hydrangea and Satsuki Azaleas bloom in May. The hydrangeas continue through June and beyond. Strother collected 39 millstones from local abandoned gristmills, incorporating them into the brick pathways and fashioning seats out of the rest and placing them strategically throughout his garden. He also collected granite mile markers, many with the numbers still visible, from the Old Wire Road. The Old Wire Road takes its name from the first telegraph line in the Southeast. These historic markers add a whole new dimension to the garden. This approximately two-acre garden is an area where Dave Strother planted camellia seedlings as well as new cultivars for evaluation. It has a wonderful “secret garden” feel to it. Work is under way to make it more accessible. There are some real hidden treasures waiting to be discovered here. In 1969 the Thomas Jefferson Smith Memorial Greenhouse was built to shelter frost-tender camellia species, as well as to demonstrate the art of growing camellias under glass for the production of show flowers. It is a landscaped planting with other plants to complement the camellias. Other fixtures include brick walking paths and a central reflecting pool. The greenhouse honors the very first ACS life member, Mr. Thomas Jefferson Smith. 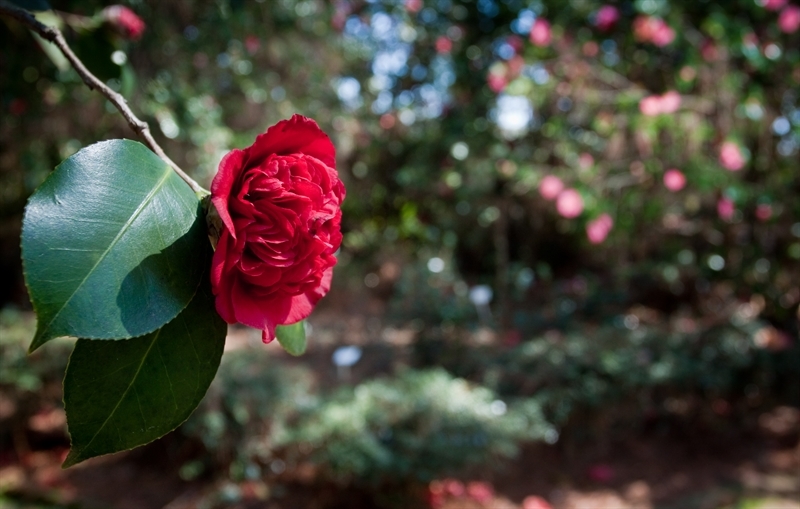 Dr. William Ackerman has spent nearly 50 years working to improve camellias. His breeding work has produced fragrant hybrids, cold hardy hybrids that greatly extend the area in which camellias can be grown, and yellow flowered hybrids. This planting strives to exhibit all of his hybrids. The development of this garden continues with the plan for it to feature several different camellia collections. The Camellia species collection continues to be expanded to be as complete a collection of the wild Camellia species as can be safely grown out in the open in middle Georgia. (Tender species will be grown in the heated greenhouses.) The purposes of this collection are to evaluate the landscape potential of these less frequently grown species, to expand awareness of other members of the genus Camellia, and to preserve a gene-pool of these species, a number of which are rare in their wild habitat. A demonstration tea planting will also be established for educational purposes. A collection of those species of Camellia that are grown for tea, as well as tea cultivars, will be exhibited. Another planting will feature those Camellia species that are grown for tea oil, one of the finest culinary oils. A collection of fragrant camellias will be another feature of this garden. Finally, the large size of this area allows for the addition of other collections in the future, assuring flexibility and options as the garden grows.